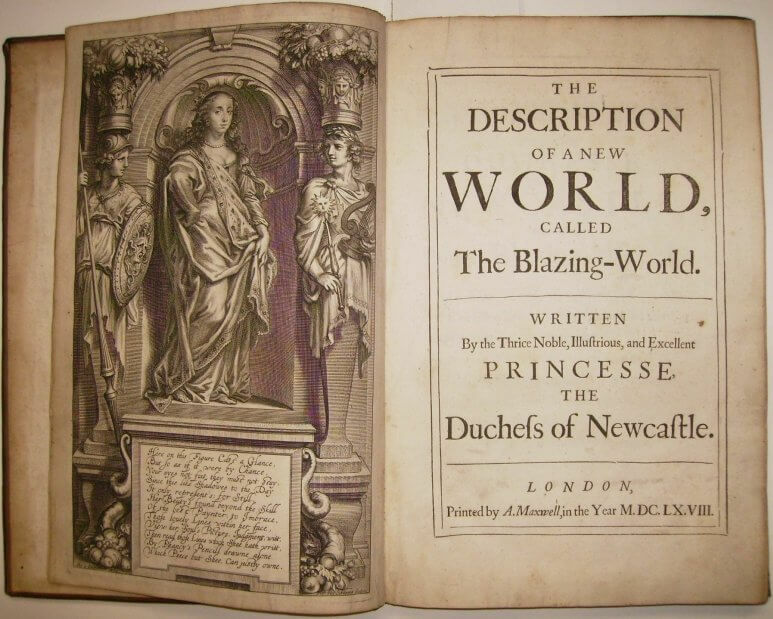 Blazing World , or its full title, The Description for a New World, called The Blazing-World (1666) was a groundbreaking work in the genre of science fiction, written by Margaret Cavendish, who was likely the first woman to publish using her own name. The book is a fantastical display of her intellect, imagination, and curiosity about natural science, at a time early in the Enlightenment when such speculation about the universe, time, and space were still considered somewhat heretical. The novel features animal-human hybrids and a woman’s absolute rule as Empress over a parallel planet. It is part of our collection of Science Fiction. To The Duchesse of Newcastle, On Her New Blazing-World. Onely discovered, lying in Time's shade. To make a World, or any such least ground? To make your World of Nothing, but pure Wit. Enlightens all with a Cœlestial Fier. Return to the Margaret Cavendish library.